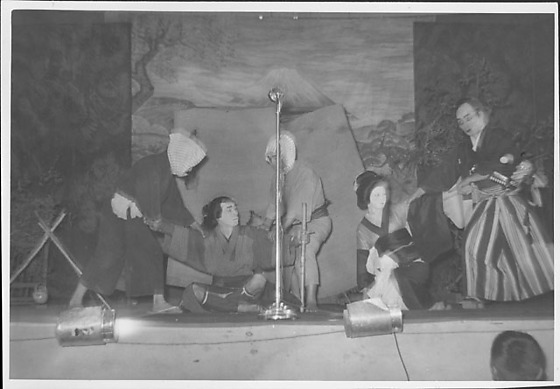 In Japanese costume, a couple is apprehended by a samurai and two men during a Kabuki performace in Rohwer concentration camp, Rohwer, Arkansas, 1942-1945. Two men in kimono and headcloths grab man in kimono, leggings, wig and makeup seated on ground at L; man holds bamboo stick in proper L hand as he points toward woman. Samurai in kimono, striped hakama, swords, wig and makeup grabs the proper L arm of resisting woman at R. Woman wears dark kimono with light-colored bodice, wig and makeup. Microphone on stage, C. Teapot hangs from a tripod near fence. Mount Fuji on backdrop behind torn screen in background. Two footlights in foreground. Slightly blurred.